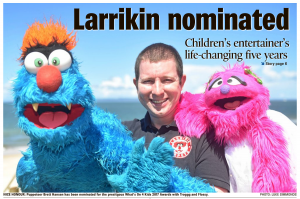 Previously we wrote a blog post about how Larrikin Puppets was nominated in the national What’s On 4 Kids Awards in the ‘Best Party Entertainment’ category. Well, thanks to all of your votes, we are now a finalist in that category! Thank you very much, everybody! We’ve answered some interview questions and are looking forward to attending the big What’s On 4 Kids Conference and the Awards Dinner, both being held on Saturday, 10 June at the Hotel Grand Chancellor in Brisbane. 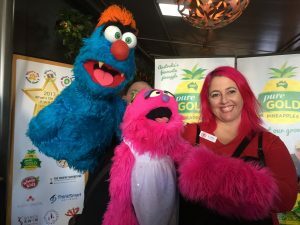 Troggg and Fossy (with Brett and Elissa) will be attending too, and meeting several other great entertainers and educators from around Australia. Whatever the outcome, we’re looking forward to spending a full day and night listening to guest speakers who are industry leaders in the children’s entertainment biz, and cheering on our fellow finalists who all share our passion for bringing smiles and laughter to their little faces, and making life fun and full of wonder and joy. Scroll down and look for ‘Best Party Entertainment’. Then scroll down the drop-down menu to find Larrikin Puppets. You may vote in the other categories too for entertainers or classes or activities that you also like. 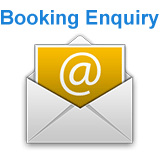 But for the Best Party Entertainment category, please do us a huge favour and give us your vote. Voting closes on Friday 17th March 2017 at 6pm EST. 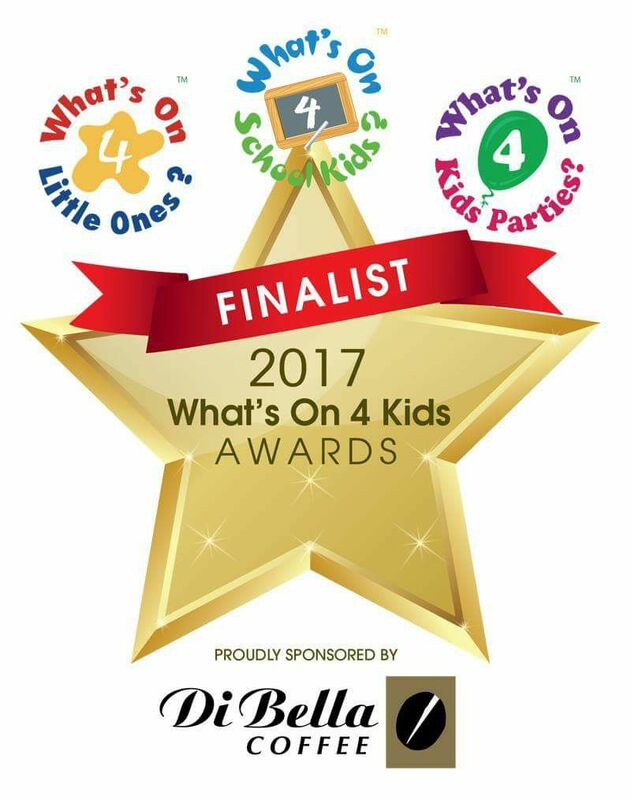 The 2017 What’s On 4 Kids Awards will be held on Saturday, June 10, 2017 at the Hotel Grand Chancellor. 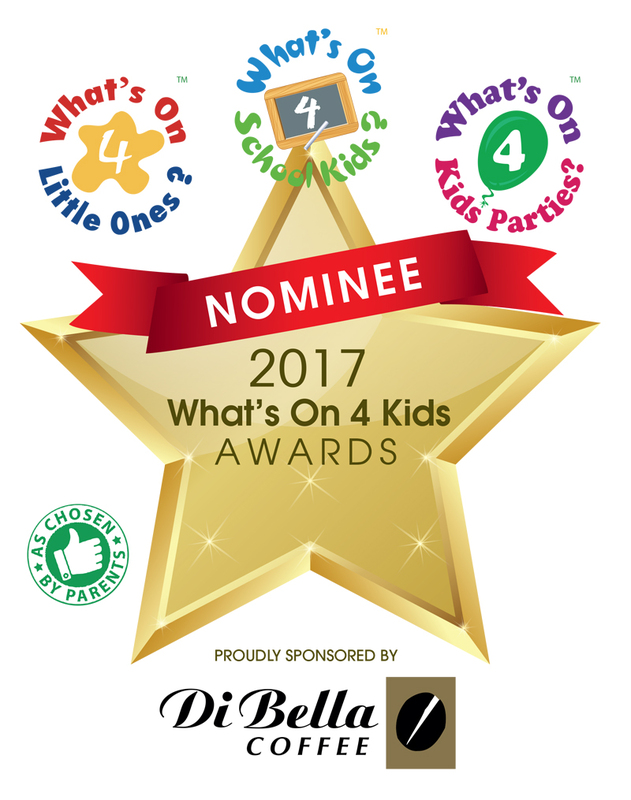 Voting in the What’s On 4 Kids Awards closes on Friday 17th March 2017 at 6pm EST. This year, Larrikin Puppets has continued to grow from strength to strength. 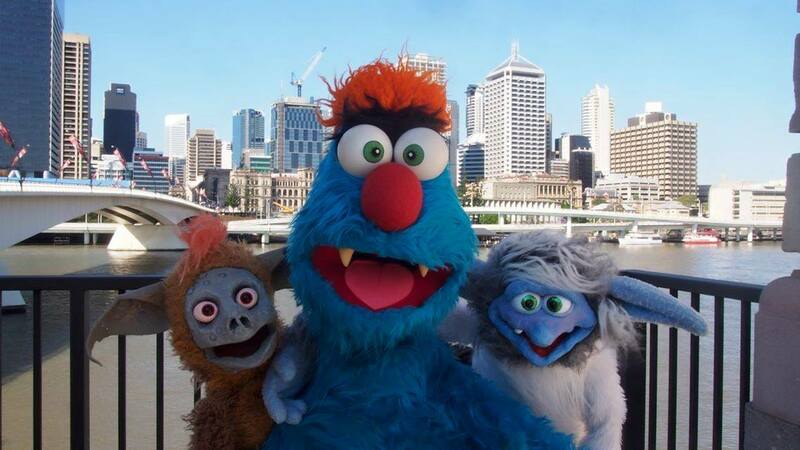 In its third year of business, the puppets have appeared at several festivals, more child care centres and schools than ever before, two Supanova Pop Culture Expos, regular shows at South Bank Parklands, a series of family variety shows at Morningside’s Studio Theatre & Cafe, a film appearance in artist Richard Bell’s movie “5 for 35” (currently showing at APT8, Gallery of Modern Art, Brisbane), a cameo in “The Hobble & Snitch Show”, and even a hosting gig on “Juiced TV” – a TV show filmed at the Lady Cilento Children’s Hospital. Troggg even got to meet Agro this year! 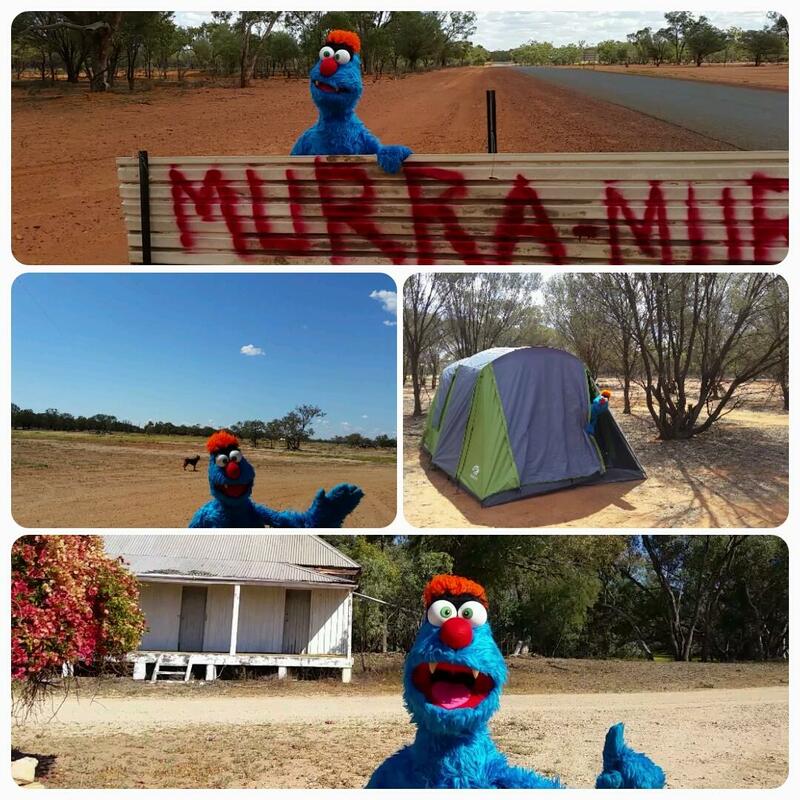 We also took the puppets along to perform in Childers, Toowoomba, and at the 5th Kooma Green School – a cultural exchange program held in the remote Indigenous community of Murra Murra in South-West Queensland. 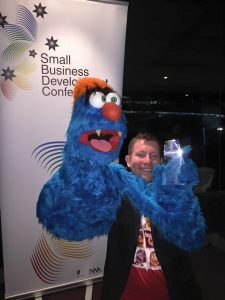 And Troggg got to accept a trophy at Etihad Stadium in Melbourne when Larrikin Puppets WON the BizCover NEIS Change Award at the National Small Business Development Conference! 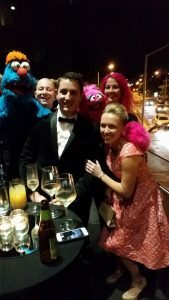 I managed to arrange Brisbane’s only cinema screening of the award winning documentary film, “I Am Big Bird: The Caroll Spinney Story” at Event Cinemas (hosted by Troggg of course). We raised $300 towards ovarian cancer research and awareness via Queensland Centre for Gynaecological Cancer in memory of my Mum. On a personal note, I got married this year! To the beautiful Elissa, who has been the most amazing friend anybody could ever wish for. Here’s to more puppet fun and adventures in 2016! 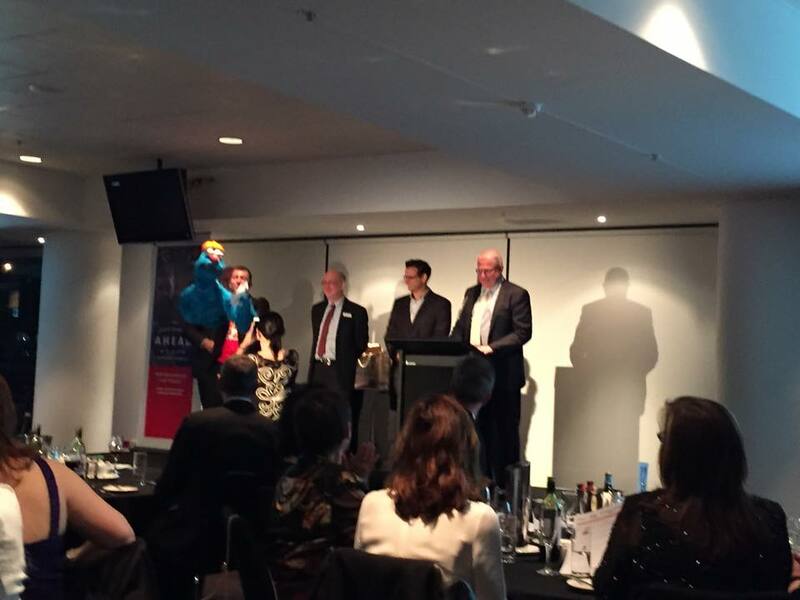 On Monday 12th of October 2015, Brett Hansen, Elissa Jenkins and Troggg flew down to Melbourne to attend the Small Business Development Conference 2015 Gala Dinner for presentation of the National NEIS Association Awards. The Awards Dinner was held in the Limelight Room at Etihad Stadium in Docklands, Melbourne. “NEIS is an Australian Government initiative to assist eligible job seekers who are interested in starting and running a small business. NEIS commenced in 1985 and is currently the longest running and most successful self employment program in the country. NEIS can provide you with accredited small business training, business advice and mentoring, as well as ongoing income support for up to 39 weeks”. My ‪Story: I have been a creative person since the first time I picked up a crayon. I have always drawn, played piano and performed puppetry. These have always been my greatest talents. I was pretty terrible at most other things at school. Fast forward to my adult life – After years of studying animation, fine art and film, nobody would hire me in those industries. I was a hobby cartoonist and keyboard player in several bands, but the only paid jobs I could ever get were janitor, dish washer, retail worker, storeman, and call centre phone monkey. I eventually studied business and office admin so that I could get better jobs. But I still couldn’t get into anything better than the above list of occupations. I was never able to earn much money. These are minimum wage jobs. My wife was very unhappy about both the money side of things, and the fact that I was depressed, miserable, and aching from all the heavy lifting. I’d sometimes work up to 15 hours a day and still not have enough money to pay the bills, let alone take my wife out for a nice dinner. 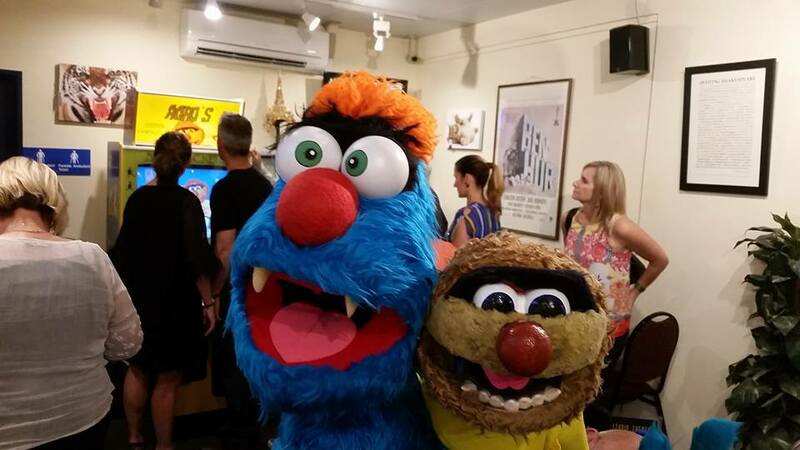 Performing puppetry was one of my talents, and eventually an opportunity to perform in a local production of Broadway puppet musical Avenue Q came up. 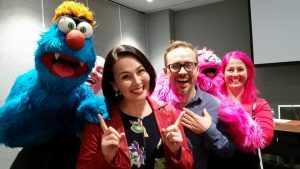 I auditioned and was accepted into the company as the show’s ‘puppetry consultant’, as I was the only one with the skills to train the other actors in puppetry. 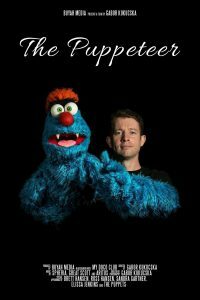 I was also cast as a co-puppeteer for two of the characters. This was a volunteer activity. No payment. But it was a wonderful experience, which I balanced with my full time day job. 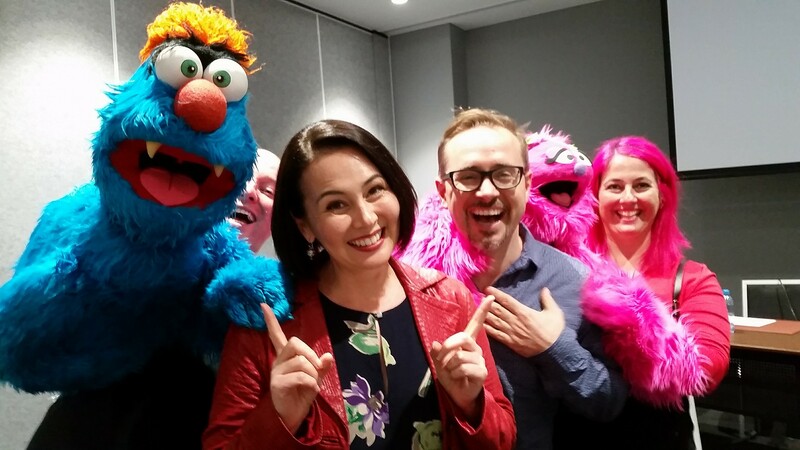 Six months later, Avenue Q ended. My full time day job ended. And my marriage ended. All at once. I was at rock bottom, with nothing to my name but whatever savings I had left, and a few puppets. 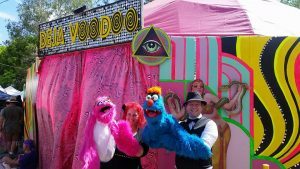 I had wanted to start up a puppeteer business on the side for a while. But time around long work hours was difficult. Now I finally had an opportunity! I had NOTHING to lose. 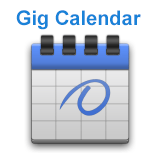 Someone suggested that when I go to Centrelink, I ask about the NEIS programme (New Enterprise Incentive Scheme), which is an entrepreneurial alternative to filling out job diaries. If you are unemployed and have a great idea for a new small business, NEIS is fantastic! They put you through a Certificate IV in Small Business Management, Entrepreneurial and Small Business Operations. Then they team you up with a business mentor for one year. Your assignments throughout the course are literally the things you need to get your business started – All the necessary licences, insurances, marketing tools, etc. 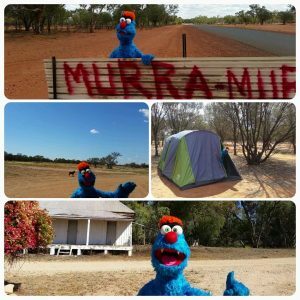 Three years later, my business takes me all over Queensland performing regular puppet shows at parties, festivals, childcare centres, schools and ticketed theatre events. 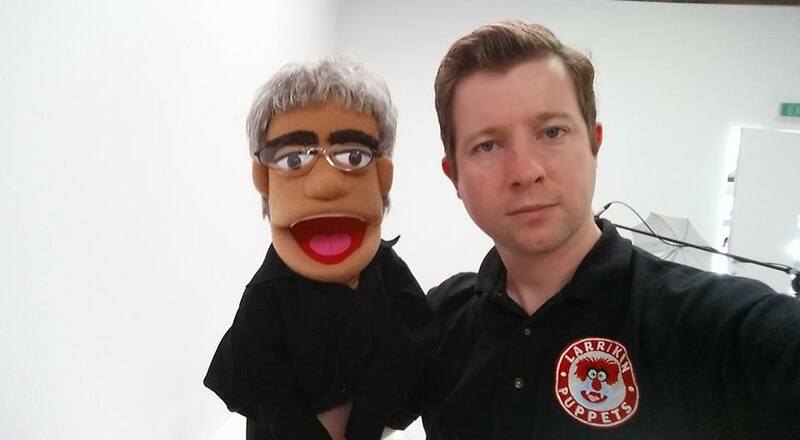 I’ve also been able to puppeteer in several film and TV projects. I met and married a wonderful woman who loves me for all of my quirks and creative madness. She shares my journey as we live and work happily from home together. 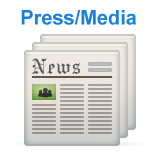 And tomorrow, we’re off to Melbourne to attend the National NEIS Association Awards Gala Dinner. 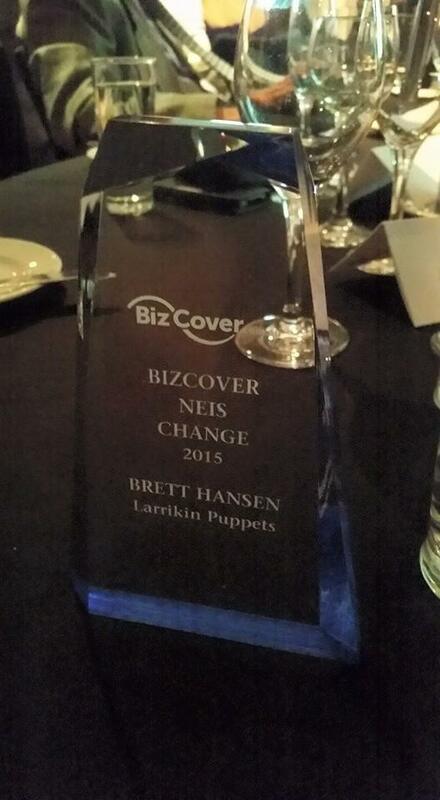 My NEIS mentor nominated Larrikin Puppets in the ‘BizCover NEIS Change Award’ category, and now I’m a finalist in the top 3! My life went through some huge changes at the time I started my business three years ago. That’s why I’m up for a “Change” award. But whether I win the award or not, my life is better than it ever was before three years ago because every day is now different, interesting, exciting and full of love and support. And that’s what motivates me to get up everyday and run my own business. 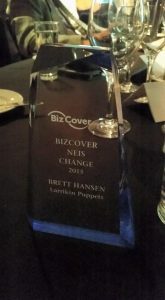 Brett (and Troggg) won the BizCover NEIS Change Award on Monday, 12 October 2015 at the Small Business Development Conference in Melbourne.